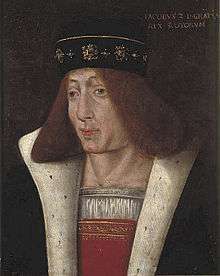 James II (Middle Scots: Iames Stewart; 16 October 1430 – 3 August 1460), who reigned as king of Scots from 1437 on, was the son of James I and Joan Beaufort. Nothing is known of his early life, but by his first birthday his twin and only brother, Alexander, who was also the older twin, had died, thus making James the heir apparent and Duke of Rothesay. Curiously enough, James held no other titles while Duke of Rothesay. On 21 February 1437, James I was assassinated and the six-year-old Duke of Rothesay immediately succeeded him as James II. In 1440, in the King's name, an invitation is said to have been sent to the young 6th Earl of Douglas and his brother, eleven-year-old David, to visit the king at Edinburgh Castle in November 1440. They came, and were entertained at the royal table, from which they were treacherously hurried to their doom, which took place by beheading in the castle yard of Edinburgh on 24 November. Three days later Malcolm Fleming of Cumbernauld, their chief adherent, shared the same fate. This infamous incident took the name of "the Black Dinner". But James did not acquiesce with this situation without argument, and between 1451 and 1455 he struggled to free himself from the power of the Douglases. Attempts to curb the Douglases' power took place in 1451, during the absence of the Earl of Douglas from Scotland, and culminated with the murder of Lord Douglas at Stirling Castle on 22 February 1452. 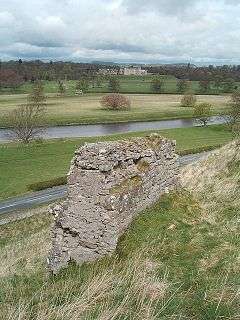 The Scots carried on with the siege, led by George Douglas, 4th Earl of Angus, and the castle fell a few days later. 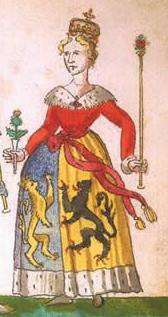 Once the castle was captured James' widow, Mary of Guelders, ordered its destruction. James's son became king as James III and Mary acted as regent until her own death three years later. 1 2 3 4 5 6 7 Mackay, Aeneas James George (1892). "James II of Scotland". In Lee, Sidney. Dictionary of National Biography. 29. London: Smith, Elder & Co.
↑ Mahoney, Mike. "Scottish Monarchs - Kings and Queens of Scotland - James II.". www.englishmonarchs.co.uk. Retrieved 2016-10-11. ↑ "Edinburgh International Festival 2014"
↑ McAndrew, Bruce A. (2006). Scotland's Historic Heraldry. Boydell Press. p. 173. ISBN 978-1-84383-261-4. ↑ "Elizabeth Mure of Rowallan". Thepeerage.com. Retrieved 11 October 2016.